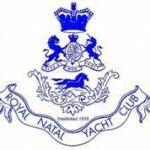 The 50 year reunion of the Class of 1953/54 was held at the old SANC "General Botha", now the South African Naval College, in Gordon's Bay in March 2004. The reunion took the form of a nostalgia weekend and the class and their partners lived aboard the old Bothie from Friday through to Monday morning, during which time they conformed closely to their old living in routine, except that there was no "clean ship " or "slack party". The group was augmented by a bugler/trumpeter (Leading Seaman Marius Pheiffer of the SA Navy), to give even more authenticity to the activities, and by the Officer Commanding the SA Naval College, Captain F.J. "Lilla" Du Preez, the first woman to command the College. The photos show the group engaged in various social activities centred on the Officers Wardroom. The actual reunion dinner was held in the old cadets' dining hall and the ex cadets mustered on the quarterdeck for drinks before dinner. They dined at the same tables and were presented with the same menu as they used 50 years ago. The photos show the "lads" and their partners at this function. Sunday was occupied by a scenic tour of the "Four Passes" with a stop over for lunch at the beautiful old Stellenbosch wine farm of "Oude Nektar", where the group was hosted by their former "chum" Hans Schroeder and his charming wife Midori. The photos show the pre-lunch wine tasting outside the cellar, followed by lunch under the oaks.